I don’t particularly do sarcasm. Especially on the internet. For sarcastic intent to register online I think it needs to to be heavier-handed than George Foreman wearing concrete gloves. So, trust me that I mean this question seriously. Why is there so little romance in evidence in those things they call designer board games? Where, I might ask, is the love? If we believe in love as the most powerful, important human emotion, why is it so seldom explored in games of this form? Is it really more valuable for games to rehearse untold different ways to accumulate wealth? Partly this thought comes as the result of a different medium of game experience. 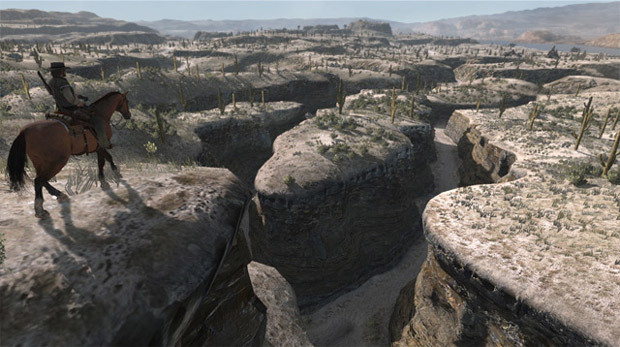 Recently, I’ve spent quite a bit of time playing Red Dead Redemption on the Xbox 360. It’s very rare for me to play any console game to completion (in the sense of completing the main story – I haven’t the faintest interest in achievements and that kind of thing). In this case, I did. In large part, it was the heart in the story which kept me with it. Red Dead Redemption is an open-world game which tells the story of a former gang-member kidnapped by the US government, and ordered to hunt down the other members of his gang. I played John Marston – the former gang-member – as a good guy; I wanted him to succeed in getting back to his wife and child. I wanted to believe in the redemption the title of the game promised (even if the amount of killing on the route to that redemption is high, and therefore the premise does require the suspension of certain critical instincts). And, to the extent that belief in a work of fiction is meaningful, I did believe in Marston’s quest. I felt enriched for guiding him the more morally-decent way through the game (which a player need not do – Marston can be played as cruel and dishonest, if the player wishes). My mind also returns to a much earlier gaming experience. 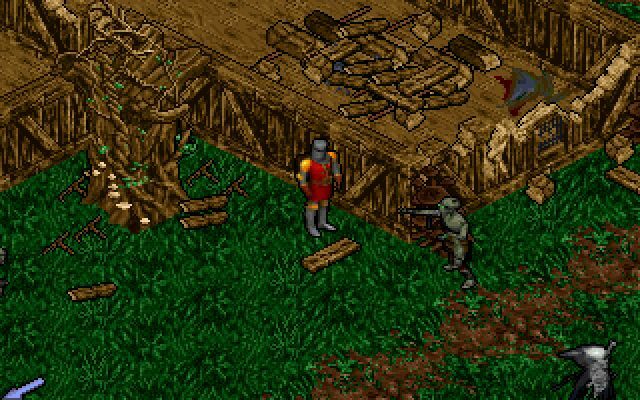 I was also moved by the sense of estrangement provided by Ultima VIII: Pagan, the 1994 instalment in the absolutely superb RPG-series, which stranded the Avatar (the playable character) on an alien world under the power of an evil deity. Though the Avatar is not asserted to have family or children to whom to return, the sense of the character being lost, isolated and indeed lonely was powerful to me. There is only one ultimate route to success, but the game explores the difficult moral choices the Avatar must make if he is to overcome the Guardian, the god supressing the world of Pagan. So, I have in mind love in a very broad sense – a sense connected with good, purposeful action. But, to what extent is it possible for this kind of experience to exist in the kind of board games I enjoy? I’d prefer not to believe that board games are fundamentally limited in the emotions they can address and the life-processes they can simulate or replicate. There’s value in simulating competing for riches, of that I have no doubt, but must it dominate board and card games? This said, I do understand that there are certain games which reward generosity. 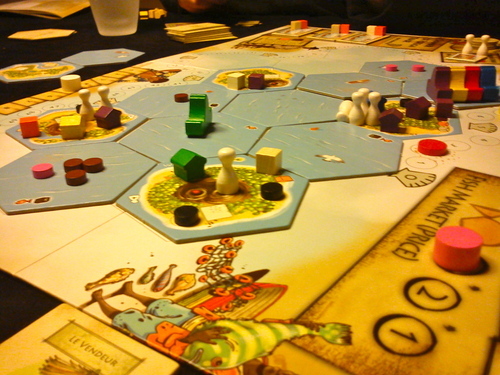 Hab & Glut (a stock market game from Winning Moves) has a rule that the player who gives the least to charity will lose, regardless of his or her earnings, while Vanuatu (an Essen 2011 release from Krok Nik Douil) sees the player who gives the most wealth to the island named the winner. I am yet to play each, but am curious how much the emotional aspect of giving is conjured by either game. In each case, my gut tells me that little of the feel of being kind is recreated by either game, since the generosity is ordered if the player intends the achieve the primary goal of either game – to win. Perhaps this implies a co-operative game can explore these parts of human nature better? It certainly feels good to find cures for the diseases blighting the world in Pandemic (which I have played on a number of occasions). Maybe if its theme were less technical, it would have more of the sense of heart that I’m imagining. Then, there are more open game systems like that of Merchants & Marauders, a game in which a player can either win through legal trade or through piracy. Many speak of the adventure of the game as feeling more important than winning or losing. Having heard this, it has become a game I’m very keen to try (if only board games fell in price after six months to a year in the way console games do). Unlike in Vanuatu, a player makes his or her own moral choices – a quality which was certainly important in making Red Dead Redemption the worthwhile experience it was for me. 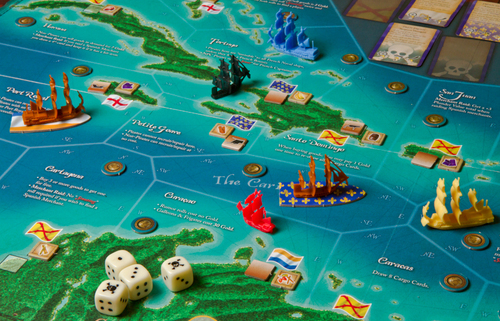 Therefore, if you’ve played Merchants & Marauders, does avoiding a life of piracy feel rewardingif you do so? What about playing as a pirate – to what extent is there the romance of adventuring (a form of romance I realise I’ve not addressed here) in playing that way? And, how real is the choice between merchant and marauder – does the game force your hand very much in either direction? I’d be interested in hearing about your experiences with other similarly open board games, too. Did the choices in the games feel emotional, or simply strategic? I’ll leave these thoughts here. I believe that recognizing a good question can mean as much as knowing a good answer. I think having the power to be good or not is the most important part of a game’s ability to explore humankind’s better emotions (I’m not sure how meaningful generosity is if it is compelled, for instance), but this is evidently complicated in a multi-player game. If being good makes one likely to lose (as will, I imagine, be true in many games in many circumstances) how useful is a game where this is the case in relation to real human experience? This entry was posted in Love, Thoughts. Bookmark the permalink. ← Be Gentoo with Me: A Review of Hey, That’s My Fish! I may be wrong but I thought in Han Und Gut it was money to have to your investors and not to charity? I was certainly taught the game that way but don’t own it to double check wording of rules. My problem with co-ops is to to me they are solo games played by a group and can sadly be dominated by the loudest most experienced voice. As I mention in the article, I haven’t played Hab and Gut personally. Instead, I’m going on the description of the game at Board Game Geek which states that ‘players donate stock to charities, which is sold off at the end of the round for the charitable donation. Whoever donates the least to charity by the end of the game automatically lose, [sic] no matter how wealthy he’s made himself.’ Just checking now, though, and only one of the three reviews in English on the site mentions donating to charity. So, I don’t know. But, if charitable donation is part of the official rules, yet the game functions identically if this is said to be money for investors, then I guess it says something about how kindness is rendered by the game. I understand your feeling about co-operative games, but it’s not one I share entirely. I think they can be a good way to play with people who are less experienced with modern board games than I am. If I promise myself to leave a lot of the puzzle-solving to my less experienced playing partners, and only nudge them subtly and occasionally, then I think they’re a good introduction to modern games for whomever I’m playing with (and I can enjoy seeing how they approach the puzzle). I would avoid playing such games with a lot of people who fancy themselves more serious players, however. Indeed what a good question! Really thought provoking, thanks Mark. I’ve got Bibleopoly which I played once. It’s monopoly but the players, I think, are compelled to be generous and king to one another. As you say, if you’re compelled then it’s not really of much value. Maybe I’ll give the game another try! Don’t know if you’ve played Forbidden Island – it’s like Pandemic Lite, so plays well as a co-op game with slightly younger people than Pandemic, It has a lot of the same mechanics, but it’s theme is less technical (as a group: grab shiny things, get off the island together before it sinks). I’ve never beat either. Possibly in order to meet your criteria, the characters in both games would need a little more detail than ‘Scientist’ or ‘Explorer’ – then they could be more relatable and less abstract?